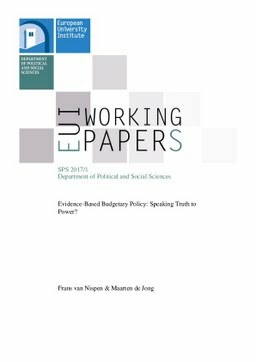 RePub, Erasmus University Repository: Evidence-based budgetary policy : speaking truth to power? Evidence-based budgetary policy : speaking truth to power? The relationship between policy analysis and public budgeting has spurred quite some debate since the 1960s when Robert McNamara, Secretary of Defense in the Kennedy administration, launched his Planning Programming Budgeting System (PPBS) in an effort to improve the allocation of resources and efficiency in the public sector. More recently, we have witnessed a revival of performance budgeting due to the New Public Management (NPM) movement, which may be considered as a vehicle to serve old wine in a new bottle. The bouquet is fine as the negotiations about next year’s budget are now flavored by performance information. However, the aftertaste is somewhat backward as the constraints of performance budgeting have become clear. In this paper we look back at the 50-year history of budgetary reform to assess the progress that we have made since the first efforts to establish a more evidence-based fiscal policy. At the end, we conclude that budgets are still largely decided by power rather than by truth, or evidence that something works.